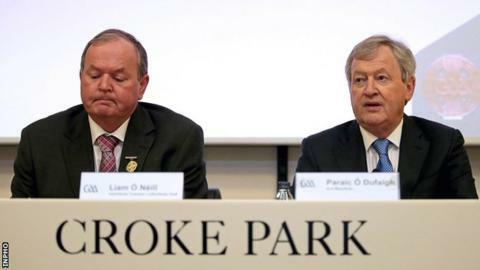 The GAA's director general Paraic Duffy has reaffirmed Croke Park's confidence that the Casement Park redevelopment will become a reality. Last month, a ministerial decision to grant planning permission for the project was quashed but the GAA is set to submit a new planning application. Writing in his annual report, Duffy made clear his conviction that the project will proceed. "I am confident we will resolve the outstanding issues in 2015," he said. "The decision to proceed with a new stadium in Belfast was relatively straightforward based on the level of funding from the Northern Ireland Executive (£62.5 million), which means that a modern all-seater stadium will be built at a cost to the GAA of £15 million sterling. "When complete, the new stadiums (Casement Park, and Páirc Uí Chaoimh in Cork) will represent a good return on a Central Council investment of around €40 million. "The challenge will be to provide a sufficient number of major events to ensure, at the least, that they cover their costs." Duffy says stadium issues in Belfast and Cork have brought to the fore the issue of adequate stadium facilities across the board. "The issue is not one of overall capacity, but rather the increased demand for seated accommodation. "This is a major deficiency in current provision, one highlighted on the occasion of the All-Ireland hurling quarter-finals in Thurles, where the venue simply could not accommodate the demand for stand tickets. "Many people who would have attended the games if seating had been available decided to stay at home rather than stand on the terraces. "This is a trend we cannot ignore, so any further development of our existing stadiums must take this into account, beginning with Pairc Ui Chaoimh." Duffy said that the completion of the Casement Park project and ground upgrades in several other northern counties have left Ulster facing a "problem" in relation to Clones. "Assessing current provision on a provincial basis, the opening of Casement Park will leave Ulster in a strong position when one considers that the grounds in Ballybofey, Omagh, Derry, Cavan, Enniskillen, Armagh and Newry have all undergone a degree of modernisation in recent years and are well geared to meet the needs of their counties for the foreseeable future. "The main problem facing Ulster relates to the future of Clones, a ground with a capacity of 35,000 but where major investment in terms of both maintenance and modernisation is needed." Referring to the GAA's president-elect Aogán Ó Fearghaíl, Duffy said that the Cavan man was "exceptionally qualified" to undertake the role. He brings a wide range of experience at school, club, county and provincial levels to the highest office in the GAA. "The position of Uachtaran is a demanding full-time role and I am well placed to see the huge commitment of time and energy required to visit, support and motivate our 2,000 clubs. "Aogán is well equipped to fulfil that challenging aspect of his new role."